For an Ironman 70.3 or other 4 to 7 hour event, nutrition can be an incredibly important factor. In shorter distance triathlons you can get away with making some nutrition mistakes, but during a 70.3 triathlon, it is more likely that you will be punished for nutrition errors. In fact, when you talk to athletes who did not have a good 70.3 race, they will often mention nutrition as the main reason why things did not go as planned. In this article, I will briefly discuss the basics, a few general rules of nutrition and some of the most common mistakes. Because the aim is to provide clear basic guidelines, I have simplified a few things. Later when a more advanced plan is developed we can bring in some of the nuances. We can also bring in more of the individual differences between athletes. Your main fuel for an event like this is carbohydrate, especially if you are completing the race closer to the 4 hour mark than the 7 hour mark. Your body stores contain roughly 500 grams of carbohydrate (this is 2000 kcal), not enough to make it to the finish line. In theory it should be enough to get most athletes through the first 3 hours of a 4 to 7 hour race but topping up from the start is essential. Because it takes time for carbohydrate to be absorbed, you need to start early with fuelling to make sure you avoid carbohydrate depletion. Once you run out of carbohydrate stores it is difficult to recover. Drink to thirst is a recommendation that works fine for the slower athlete. If you are going a bit faster it is better to go in with a plan. It is good to use the early parts of a race when the gastrointestinal tract is working fine to absorb both carbohydrate and fluid. 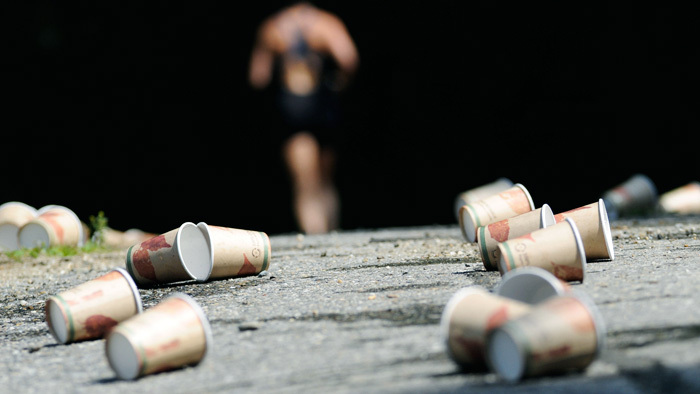 Later in the race, even though you may be thirsty, the gut may not absorb as much. Don’t drink excessively and use common sense. The goal should be to lose a little weight (2 to 4 pounds) at the finish line. You definitely want to avoid weight gain, which clearly would be a sign of drinking too much. In hot environments dehydration can definitely be a very important factor. Don’t forget that good hydration starts before the race, and hydrate well in the days leading to your race. A large percentage of athletes, approximately 30 to 70 percent, experience gastrointestinal problems during a 70.3 race. Some of these problems are very minor but some of these may be so severe that they will affect performance. Some athletes are more prone to develop these problems than others. The complaints may be totally independent of food intake and sometimes they may only happen on race day. This suggests that “race day anxiety” has something to do with it. Studies have also shown that factors like fibre intake, fat intake and the use of very concentrated carbohydrate drinks are causes of gastro-intestinal discomfort (3). So combining these three main issues, you need to plan ahead and have a rough idea where you are going to get your carbohydrate from (drinks, gels, bars), how much fluid you need to take in and where you are going to get this from (carry, special needs or feed stations) and make sure you reach approximately 60 g/h of carbohydrate intake and enough fluid to not lose a lot of weight. You can get a good idea by weighing yourself before and after training. Think about this in advance and write down your plan. Sticking to a plan at all cost. If for some unforeseen reason you cannot follow the plan (you lost a bottle, or you are developing gastrointestinal problems), do not continue with the plan at all cost. Be flexible and adapt. A slightly lower intake is not going to be a problem, forcing more nutrition in will. Do not try something new on race day. I see athletes walk around on expos, buying new products for the race the next day. Only use products that you have tried and tested, products you know you tolerate well. Caffeine (low dose: 3 mg/kg one hour before; equivalent of a big cup of coffee or 2 espressos before the start) may help some athletes. Some athletes like it, some don’t. Experiment in training and find out what works for you. These are the very basics of good fueling for a 70.3. Many athletes don’t get the basics right and many athletes are too concerned with other aspects and get distracted by details (often supplements), without paying enough attention to the basics. The next step is that the plan becomes fully personalized, but this is a little more advanced and may require a few measurements. We will cover the topic of personalized nutrition in a future blog, but for now, athletes who are willing to invest in a personalized nutrition plan can contact me via www.mysportscience.com. However, it is important to get the basics right first. You can also find more information on different types of carbohydrate here (http://bit.ly/carbtype), why advice is the same for smaller and larger athletes here (http://bit.ly/1DEsX8W), benefits of certain carb mixes here (http://bit.ly/1EI73PN) and the next, more advanced stage of fueling here (bit.ly/carbguide). Asker Jeukendrup PhD is a Professor associated with Loughborough University and director of MySportScience Ltd. After obtaining his degrees at Maastricht University in the Netherlands, he spent a year at the University of Texas at Austin before accepting a position at the University of Birmingham where he was the director of the Human Performance Laboratory. He was the Global Senior Director of the Gatorade Sports Science Institute, defining strategies for research, education and sport science services. 'He has published over 200 papers and book chapters and has published 8 books. Asker has been a training and nutrition consultant to several elite athletes worldwide, including the Dutch Olympic teams, Chelsea FC, UK Athletics and some of the World's best marathon runners (Haile Gebrselassie), swimmers, and triathletes (Chrissie Wellington, Andreas Raelert). Asker has completed 21 Ironman races including the Ironman world championships in Hawaii.